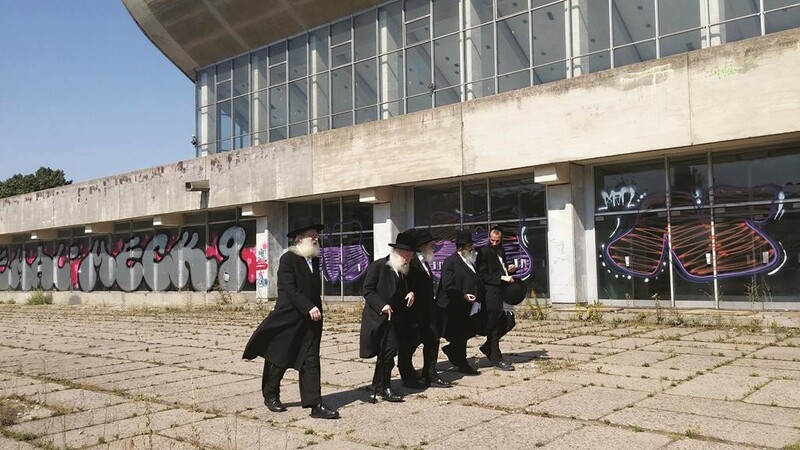 L-R: Harav Osher Kalmanowitz, Harav Schlesinger, Dr. Schaps, Rabbi Niederman, and Rabbi Yechezkel Kalmanowitz outside the abandoned Sports Palace. A delegation of leading Roshei Yeshivah, Rabbanim and askanim, shlita, met with Lithuanian officials to plead for cancellation of plans for construction on one of Jewry’s most sacred burial grounds, the Snipisek Jewish Cemetery in Vilnius. Harav Aryeh Malkiel Kotler, Rosh Yeshivah of Beth Medrash Govoha, and Harav Osher Kalmanovitz, Rosh Yeshivah of the Mirrer Yeshivah-Brooklyn, traveled to Vilna last week to express their deep concern over the matter. Local authorities claim that recently announced plans for a convention center will only affect a long-abandoned sports complex, built on the spot over 50 years ago. However, experts in cemetery preservation fear desecration of the holy spot will inevitably occur. The Roshei Yeshivah were joined by Harav Avraham Yaffe Schlesinger, Chief Rabbi of Kehillas Machsike Hadass in Geneva, Switzerland; Rabbi David Niederman, representing the Central Rabbinical Congress of the U.S.A. and Canada; and Dr. David Michael Schaps, of the Conference of Academicians for the Preservation of Jewish Cemeteries. “They [Lithuanian officials] tried to offer building memorials and the like, but we made it very clear that we want the entire area fenced off according to the historic boundaries of the beis hachaim,” said Rabbi Yechezkel Kalmanovitz. Representatives of the Lithuanian government attending the meeting included First Deputy Chancellor Mr. Rimantas Vaitkus, who welcomed the group on behalf of Prime Minister Algirdas Butkevičius, who was out of the country, and Remigijus Šimašius, mayor of Vilnius. The meetings were attended by a number of top governmental advisers and the chair of the local Jewish community, Faina Kukliansky. Both Roshei Yeshivah, who traveled only for the day, expressed the deep spiritual and historic connection of the Jewish people to Vilna and Snipisek. “Ask a child in Vilnus today what Lakewood is and he will not know, but if you ask any child in Lakewood today what Vilna is, he will know immediately what it is and what an illustrious place it occupies in the history of the Jewish People,” Harav Kotler told officials at the meeting. The trip entailed an additional effort on the part of BMG’s Rosh Yeshivah, who needed to arrange for minyanim along the way, as he is in aveilus for his recently departed mother, a”h. Sadly, the original tombstones fell victim to Nazi occupation and Soviet rule. The Vilna Gaon and the Ger Tzedek were originally interred there, but their remains were moved in the 1950s, when the communist government began construction of the sports complex on the cemetery’s edge. Asra Kadisha and the Conference of Academicians for the Protection of Jewish Cemeteries have repeatedly protested the planned project and have been working with the U.S. State Department and Lithuanian authorities to block plans for construction. Recently, a group of 16 major American Roshei Yeshivah issued a kol korei declaration protesting desecration of the site. This article appeared in print on page 8 of the September 3rd, 2015 edition of Hamodia.